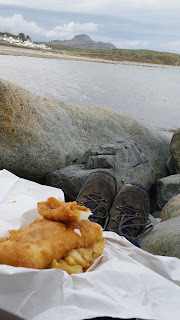 Back from another top Burketeering Burkeathon weekend, and now I'm packing my chest infection off to Tywyn for a week. I'm a bit grumpy because it is the third and final part of The Magus. My other half hasn't been listening to it, he is fed up of the name Tom Burke, and there is no wi-fi where we are going. Oh sod it, "please can we listen to Radio 4 at 3pm?" "Yes of course, what's on?" "Oh just the final part of a play I've been listening to." Yes! We set off at just the right time so that I get to hear the entire episode during the car journey, and I cough majestically over the bit where the announcer says "and the part of Nicholas Urfe was played by Tom Burke." 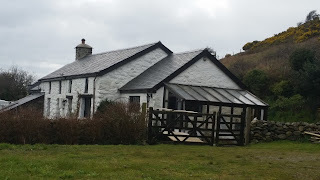 The cottage I am staying in is gorgeous, in a place in Wales called Tywyn, and whilst it is a long drive from the main road it is worth it. The views are fabulous and you are surrounded by sheep. 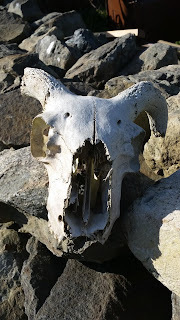 Sadly by the gate some poor chap had obviously not fared too well over the harsh winter months. Oh well, an unusual welcome to be sure! I shall call him Yorick and he shall be my friend for the week! 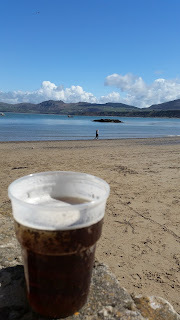 So, no walking in the lovely Snowdonian range this holibobs because of my constant coughing, but I have relaxed on a couple of beaches, one of which was a lovely National Trust beach...with a pub on the beach! Awesome! Beer is a well known medicinal cure for chest infections don't you know!!!! 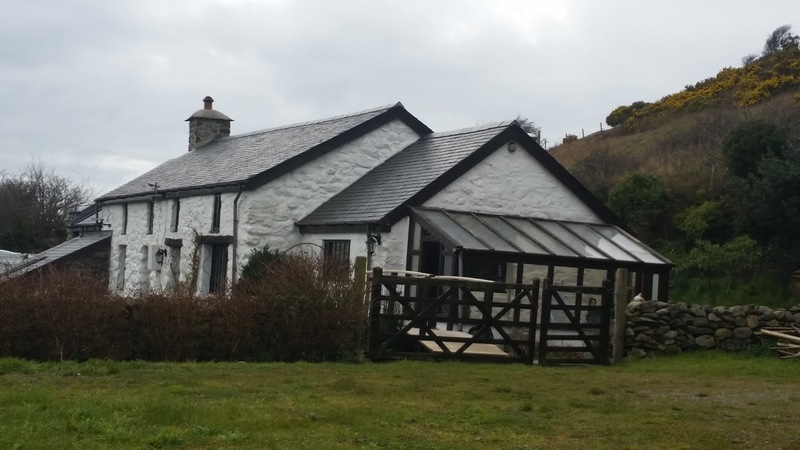 Porthdinllaen is an old fashioned fishing village, you need to park your car in the National Trust Carpark, risk your life walking through the golf range, and then climb down a path to a beautiful sheltered sandy beach. It is a gorgeous beach, and made even better in that you can have a relaxing drink at the the Ty Coch Inn which sits directly by the beach (or you can take your drink away with you in a plastic "glass". There is no point going to the seaside if you're not going to have fish and chips, and just because I'm suffering, and it's only April and we're facing the Irish Sea at 6pm, there is no excuse not to sit on the beach at Criccieth and watch the world go by, whilst shooing gulls away from your dinner! Nom nom nom!!!!! 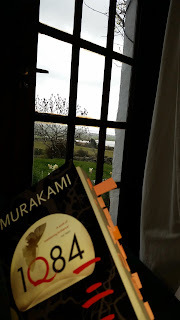 As I've been able to do very little this week, I have managed to read most of my Box Clever Challenge book for April, Murikami's 1Q84. If you liked Wind Up Bird Chronicle, you will love this epic volume, although I'm not sure I'm going to enjoy trying to work out what to say about the book. "It's very good" doesn't quite seem to cut it! 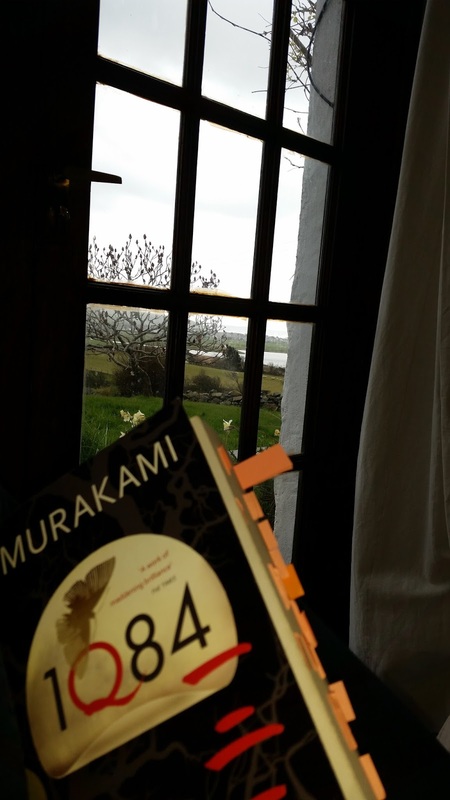 Still, I must say, sitting in the cottage, watching the very peaceful world go by and reading a book with a cuppa is my idea of a good holiday. I think this sums my week up rather nicely!